We may not be making miniatures houses any more, but we don’t seem to be able to leave this house-finishing business alone. About the time of my last post, two months ago, a swarm of ladder-and-crowbar-wielding men began tearing the dented 70’s aluminum siding off our full-size, 1928 house. It was one of those projects that began as a repair, and burgeoned into a summer-long re-do. 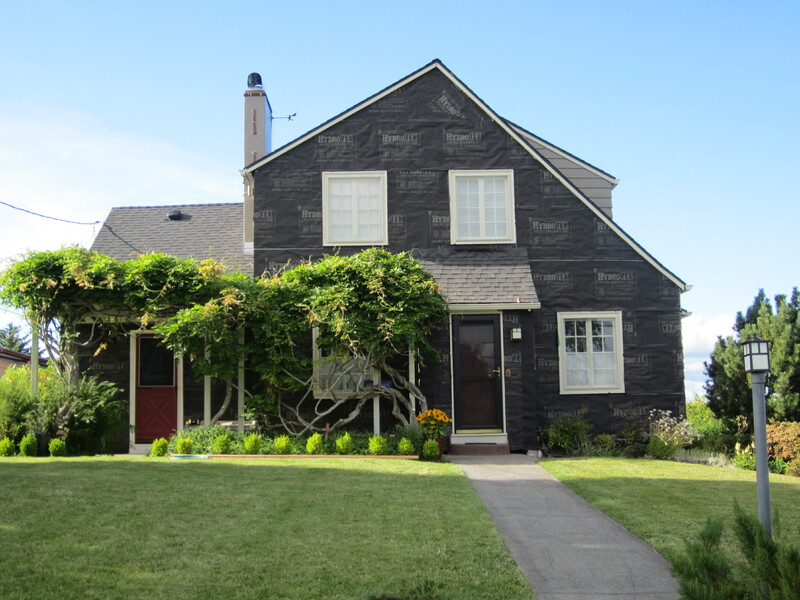 When we first bought the house, 11 years ago, we found a tiny picture of it with its original shingle siding at the assessor’s office, and always hoped we could restore it to that look. The aluminum siding crowded the door and window trims, and filled in most of the roof overhang, the end result being it just didn’t look the way it was meant to. A little stubby and confined in the wrong coat. We re-painted, and added shrubbery but it still looked like a mis-fit. On Day One the de-constructors revealed filthy, Pepto-Bismal pink shingles under the aluminum—some areas trimmed in lavender, some in the same shade of pink, and others in chartreuse. 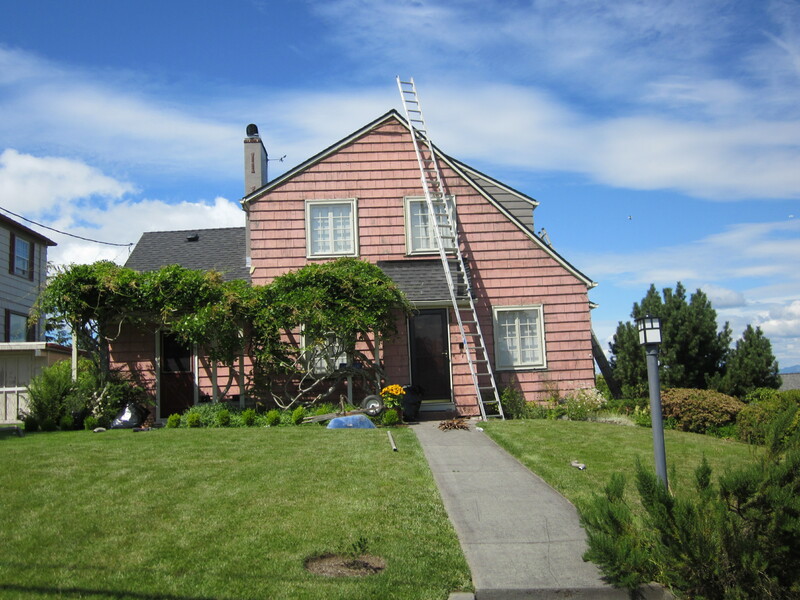 We had heard from neighborhood old-timers about the all pink house, and found traces of it, but seeing it in its entirety was a shock. Almost embarrassing, like catching someone outside in their ancient pink nightie. Other points of interest included thousands of spider nests in the happy playground between shingles and aluminum, and surprisingly few examples of the rot we love to show on our miniatures. Some mystery openings appeared on the back of the house, possible remnants of a vertical pie cooler area from the original kitchen. 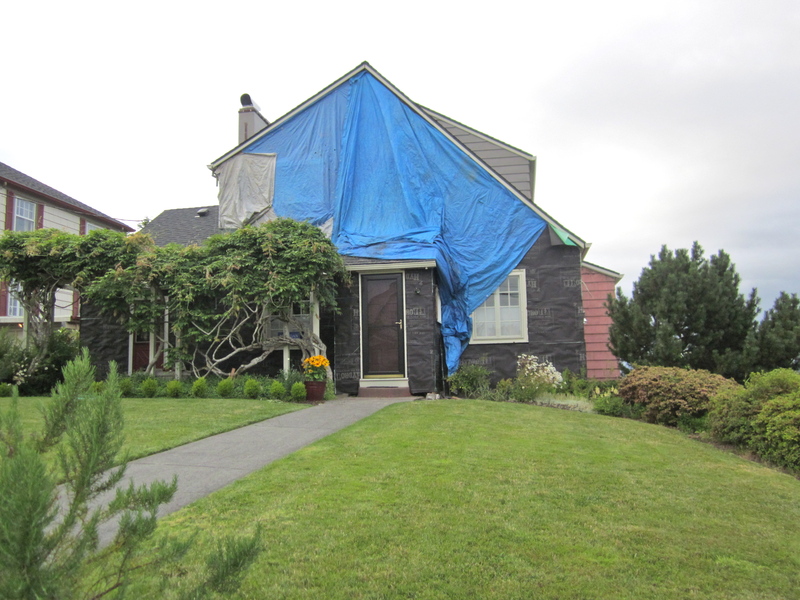 We and the house spent that night under a blue tarp and threatening skies. Inside we were bathed in an eerie blue light. 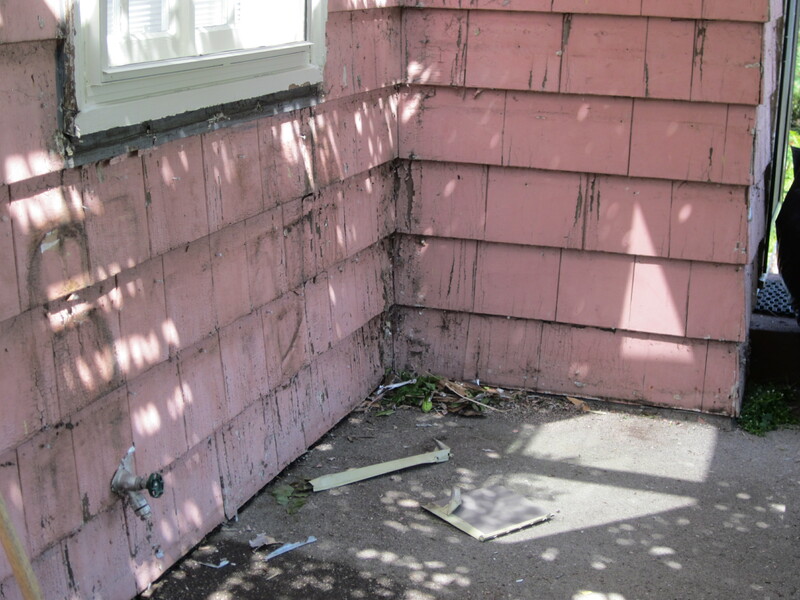 Days Two-to-Three and we went to all black—new water-barrier tarpaper where the old had been removed. 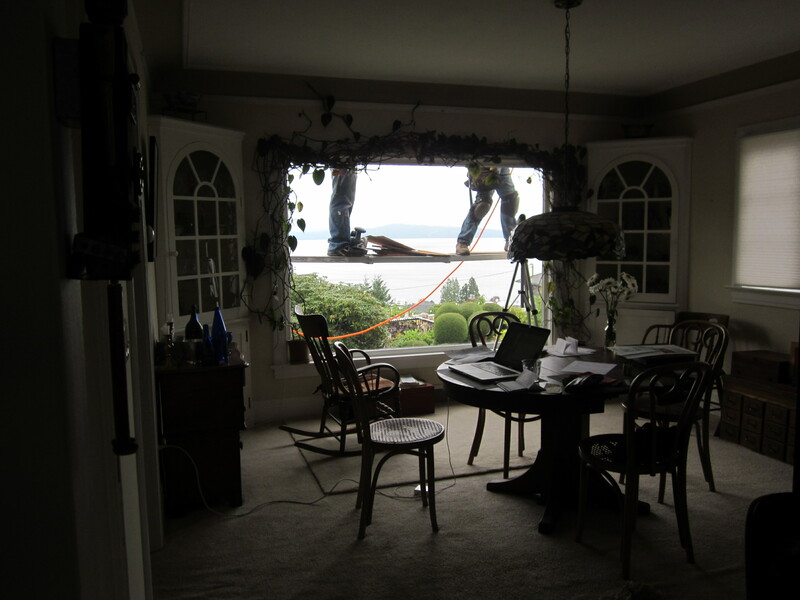 There were times when men on ladders seemed to inhabit every window of the house. Work continued on the back where there’s a downstairs bath room addition that had been built poorly, and was full of rot. The window had only been set into the frame (no wonder that room was so drafty), and not attached to the house. The workers removed the nearby downspout along with the window to clear the rot, then, at the end of the day set window back in the hole for the night. Sure enough, at 6:00 the next morning we had a gully-washer–water cascaded down the roof and downspout hole and inside the top of the window. I phoned the contractor’s phone, then Noel and I alternated trying to jury rig a garbage bag tarp to the wall on the outside, and funneling and mopping on the inside. Multiple calls to the contractor went unanswered, but at 8:30 his 9-months pregnant wife appeared with towels and profuse apologies. By then the rain had stopped, two workers had arrived with a downspout fix, and we were pretty well mopped-up. Day Four dawned with a Sani-Can adorning the parking space in front of the garage, followed by the delivery of 6 ft. stacks of cedar shingle squares. The cedar smelled like campfires, and signaled the best part of the job. At this point, the house felt like one of our mini-houses—a nice clean shell awaiting its shingles. It is also when the work slowed down, as we have many more architectural ins and outs than I was ever aware of. It took one man—the master shingler–over a week just to fit the shingles around the front door extension. He had to hand-cut nearly every one, weaving the corners to keep the rain from finding a track in, just as we had done on multiple little structures. They seemed happy to have us compliment their work, but I think they thought we were a little nuts when we’d compare it to what we did in miniature. There was never even a flicker of interest in our miniature houses, they just wanted to get the job done. As you can imagine, the noise level in and around the house was anything but miniature. When they weren’t tearing things off, the workers were pounding nails in, ratcheting ladders up and down the walls, and running portable saws of varying sizes. 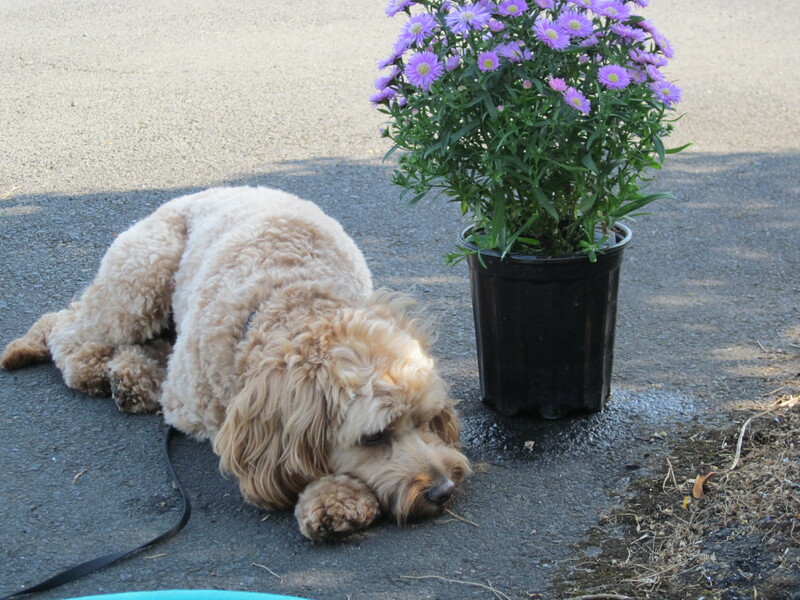 Our days began with a trip to doggie daycare to drop off the traumatized Max, our almost-2 cockapoo. Noel fled to his painting studio downtown, and I moved the laptop down to the dining room, or the furthest corner from the main racket. The neighbors went quiet, but, when asked, showed enthusiasm for the project. The workers were great about cleaning up at the end of the day, to the point of raking and sweeping up, but my evening patrols usually netted a handful of Red Bull and powdered donut empties in the shrubbery. By Day Sixty, the job was largely done, if not in the unrealistically estimated three weeks. Too many unpredictables. To this day, we are not quite done—still awaiting that elusive bathroom window replacement, promised, once again, for this Thursday. And a few adjustments to the downspouts, a little trim paint here and there, but by and large done. 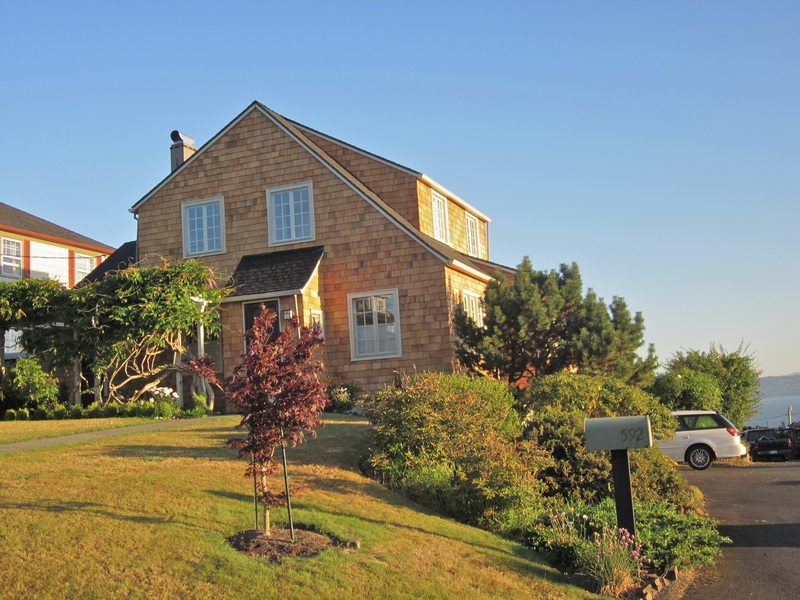 I haven’t quite become accustomed to the new look of the house—maybe it’s the orange color of new cedar, brilliant in some lights–but I do love it overall. Architecturally, it looks as it was meant to from the start, and is a much more graceful house than before. Its new skin is the right fit. Once the cedar grays down it will look more as I imagined. It is curious how it looks like something we might have built—before the Bug Juice. In all its newness, it seems to cry out for weather and age, which will come, and the Thomas trademark touch of rot, but I think we’ll skip the latter on this one. And yes, the contractor’s wife delivered an on-time, blooming, 10 lb. 12 oz. baby girl, her sixth child. No wonder Daddy works so hard. The Sani-Can is gone, and while I never saw anyone enter or exit, it must have been well-used by the 12 or so men fueled solely, it seemed, by Red Bull and powdered donuts. Coming Attractions: Next week I’ll be returning to the story of our miniature houses. This entry was posted in Bio and tagged architecture, old house restorstion. Bookmark the permalink. Pat, your house is amazingly, brilliantly beautiful in all it’s new finery. Will your shingles go dark or will they get silver grey? 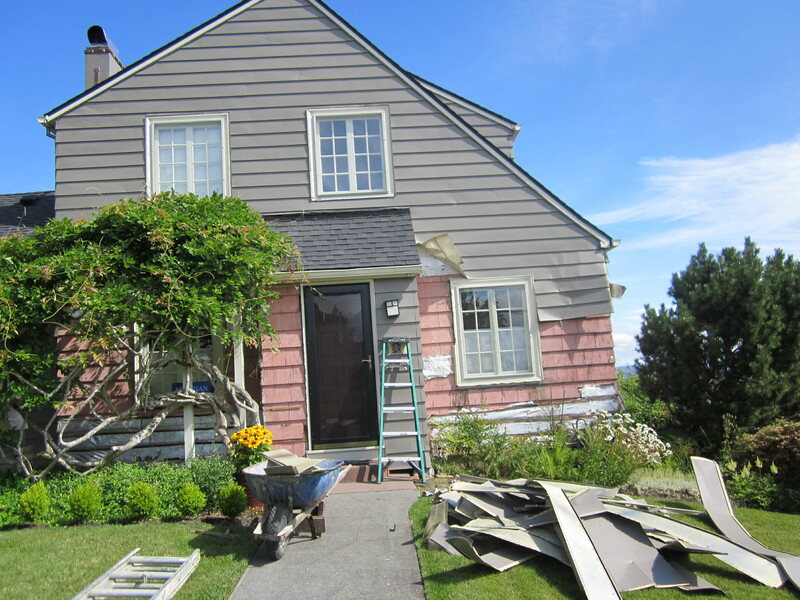 We used to apply a fluid (whose title and name escape me now) to new shingles that began the silvering process and kept them from getting the very dark brown/black color that would happen if the house was located too far from the salt air. I’m just about to begin the reno on my house and am already seeing visions of Sani-cans, donut wrappers and lots of banging. The good news is that the beauty and benefits of our extended redos will last for years and years after the last hammer echo has faded away. Well how many bottles of Bug Juice do you think it would take to colour the shingles?? Thank you I enjoyed this post and being able to visualise you in your home. How funny to see your lovely home look somewhat reminiscent of the first primitively shingled mini house you did so many years ago. Your weekly stories have been missed this summer, so it is great to have your back to mini history. Glad you like it, Corky. If you think of the magic fluid, let us know. Noel actually did a test spot with Bug Juice, but there isn’t enough of it in the world to do the whole thing. The contractor says it will go grey, but most of the houses around here go darker on the walls that don’t get much sun. The front faces south, so I’m hoping that will be light. It also depends on the type of cedar. We’ll see! Good luck with your re-do. I know you know what a noisy messy time it will be, but the results domake it worth it. 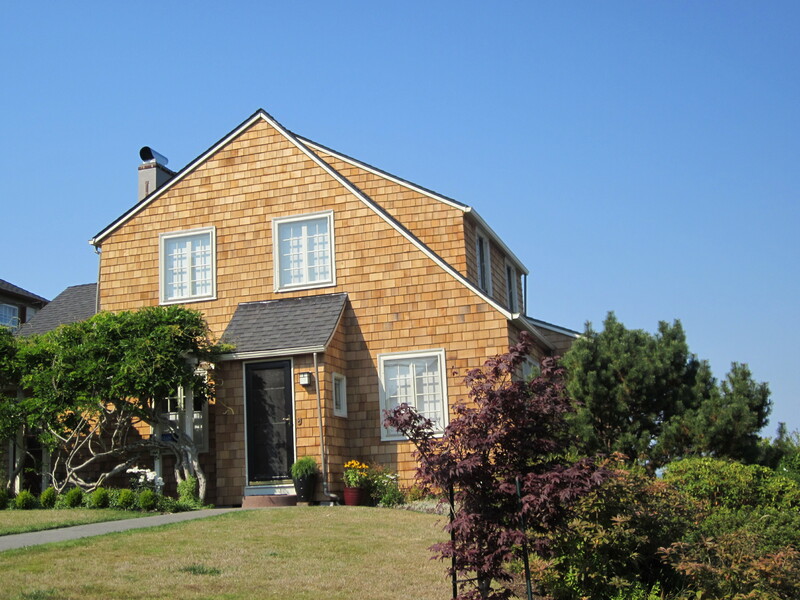 The product people put on cedar shingles to turn them gray is called “bleaching oil”. You need to use it in damp climates to help weather proof the shingles and keep them from turning black from mildew on the shady sides. It was fun to see the shingling in progress but almost completed when I picked up the brick sheets at your place in August. I loved the charming bracket details above the garage doors. 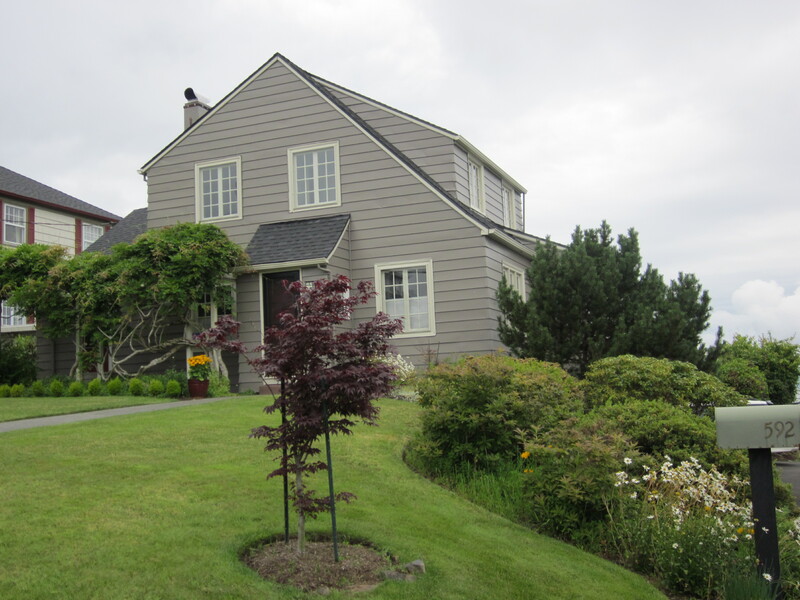 A very lovely home you have and what a stunning view of the Columbia River! All though I’m ready your post from 2011 Your writing is fresh and very enjoyable. Looking forward to the next time I can continue reading. Thanks, Pam, glad to hear you enjoyed it.